Requires good light, a mature tank preferably receiving fertilisation and slow to medium water flow. Very handy plant to give shade and security to small fish or fry. 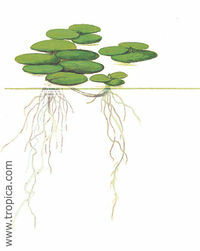 The long roots provide a growth medium for infusoria an important food for small fish. This page was last edited on 22 August 2011, at 12:13.